An excellent day’s walking of 20 miles and ascended height of just under 6000 feet 🙂 with an overall average speed of 2.2mph (including stops). A cloudy day with some mist the sun came to join me at lunch time but rapidly disappeared again to be replaced by a heavy shower at the end. But overall good walking weather. The route took in many pretty & isolated sandy coves with the major tourist centre of Megavissey where I had my pasty and some rather yummy ginger & dark chocolate ice cream 🙂 Oh how I love walking so that I can eat what I like! 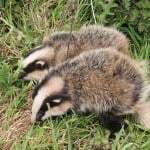 Amazing selection of wildlife today including a pair of badger cubs who were totally unafraid of me and a game bird that I almost trod on before it squawked off. I then went past the old home of A.L.Rowse with great wood carvings in the gardens, a totally idyllic setting. I’m stopping at the Old Cooperage tonight in Charlestown pleasant enough but no WiFi so in The Rashleigh Arms enjoying the fish & chips with free WiFi. Tomorrow is going to be a day off to visit The Eden Project.